Marvel is the talk of the town these days because of the blockbuster movies that they have been rolling out year after year, with each of their characters winning the heart of the audience better than the previous character. That’s why LEGO decided to roll out the LEGO version of the iconic Helicarrier of The S.H.I.E.L.D. The whole package consists of almost 3000 pieces which when put together makes a pretty impressive model consisting of the flying aircraft carrier with 2 runways, quinjets, fighter planes and ground support vehicles of microscale. As an icing to the cake, the set also comes with the LEGO version of some of the most popular Marvel superheroes, 12 micro figures that can be displayed on the deck of the helicarrier as well as in the interior of it, which is highly detailed as well. The package comes with 5 major mini-figures of superheroes, consisting of Captain America, Maria Hill, Black Widow, Hawkeye and Nick Fury. The product is well suited for 16+ kids and adults but can be played by 10+ kids and teenagers under 16 also, under proper guidance. The fact that LEGO is such an integral part of everyone’s childhood makes it appealing to everyone, and that’s why people of all ages who have watched and liked the Marvel movies are excited about it. A runaway as well with all the details that can be found on an actual runway. The helicarrier measures approximately 29 cm in height, 80 cm in length and 45 cm in its width. The quinjet, fighter planes and the truck measure about 3 cm in height, 7 cm in length and 7 cm in width as well. The Minifigure stand on which the figures will be made to stand measures 12 cm in height, 6 cm long and has a width of about 16 cm. Since the whole product consists of so many subparts, it almost makes it one of the must-have for all those people who have been playing with LEGO. The detailing of the whole structure is done in such a way that even the smallest of details are clearly visible and its importance can be seen in the structure. This makes the product unparalleled, and along with its complexity, it is much more appealing and gives the public a reason to make it and display it in their home. It also helps a person or allows them to take full advantage of their constructive, creative side and build something that is unique as there is no restriction on what one can make with the LEGO pieces. Maybe someone can make a hybrid vehicle or superhero, which can serve as an inspiration for the next Marvel superhero movie! Along with what all has been provided in the whole product, there is some add-on as well that one can use with this product to make the whole structure look more appealing and realistic. These include lights and spinning rotors that can be attached to the helicarrier and are available with the 88000, 8883 and 8870 LEGO® Power Functions sets. These sets are sold separately, and some of the regular and ardent players of the LEGO may have them already. And as mentioned earlier, there is no limit to one’s creativity while using this set. One can add anything or remove anything they want to make their set look much more effective and pleasing to the eye, or unique in its own way because that’s the whole point of the LEGO structures, to make something that is your own. The general review of the product has been great so far with people liking it very much. The price of the product is at the top end of the similar type of products. LEGO products have always been there to interact with the constructive, creative and artistic side of a person and allow them to make things at their own pace with their own understanding. The whole process of creating a LEGO model is a journey in itself, in which a person learns how each block is important for the whole structure and the same holds true for life as well. The basic idea and the prospect of building something from scratch make it a must-have for someone who likes to experiment with things and build it their own way. The simple reason that LEGO has been such an integral part of my childhood was a good enough reason for me to buy this. Adding Marvel’s characteristic mix and great detailing at such a large scale to this set only makes it a must-have for me. 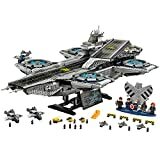 LEGO Marvel Super Heroes 76042 The SHIELD Helicarrier offers enjoyment and pleasure for a wide range of ages, do you have the ability to build this?